University of Michigan Press, 9780472012275, 128pp. 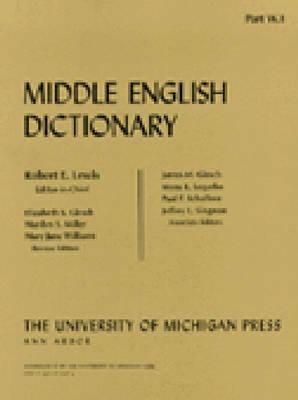 The goal of the Middle English Dictionary is to include all meanings, grammatical forms, and spellings of all the words identified by its extensive reading program. When completed, it will represent what has been called the greatest achievement in medieval scholarship in America and the most important single project in English historical lexicography being carried out anywhere today. After sixty-five years, it will have produced about 15,000 pages. The Middle English Dictionary, a monumental scholarly endeavor that began more than fifty years ago, is scheduled to be completed in 2001. The task of the editors compiling the dictionary is to document the English language from just after the Norman Conquest to the introduction of the printing press at the end of the 1400s. With that innovation the language became more or less standardized, but during the Middle Ages the language was evolving under the stress of events and social change, particularly as French culture was absorbed into the language. These were truly the formative years of the English language, and they present major challenges to lexicographers. Fascicles V.1, W.1, and W.2 are the most recent additions to this ongoing undertaking. Published volumes include all fascicles from A.1 through U.3, plus the Plan and Bibliography.